I was recently looking back on my 2015 posts, trying to figure out which brand truly stood out among the rest. If there's one thing that I've noticed, it's that French skincare and beauty companies take their products and formulations very seriously. You pay for the quality that comes along with manufacturing in France, and the premium laboratory formulations. 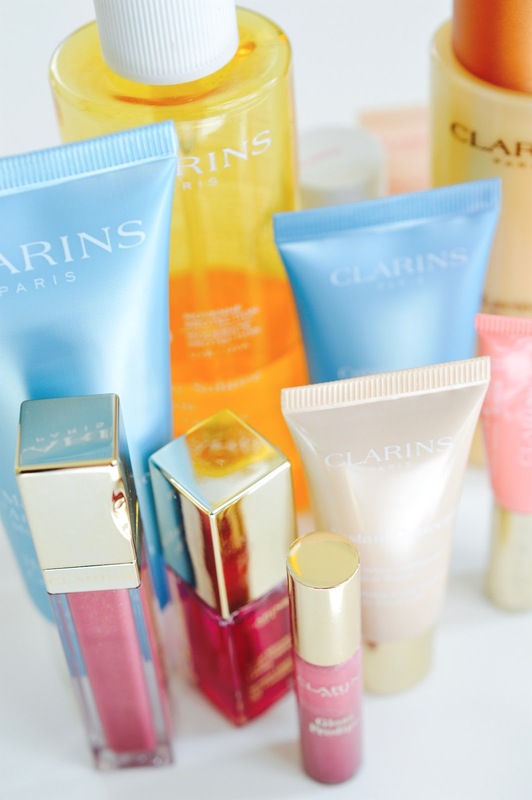 That is what makes Clarins the best brand that I indulged in last year. These "lip perfectors" have a total cult following. Earlier in 2015 they were on everyone's Instagram flat lay, and I was thrilled to find a mini size included in one of my gift-with-purchase sets. I can't say that this is my favourite balm/gloss from the brand, simply because it doesn't really nourish my lips as much as I'd like. The vanilla-y flavour is just OK, and the light pink tint doesn't do much for my lips. I might consider trying a darker shade in the future. O.M.G. 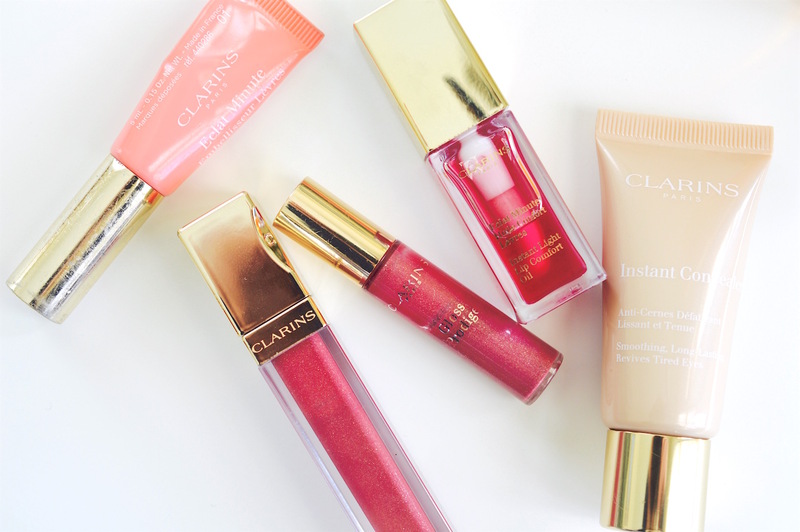 I do not need any other lip products after trying this gloss. 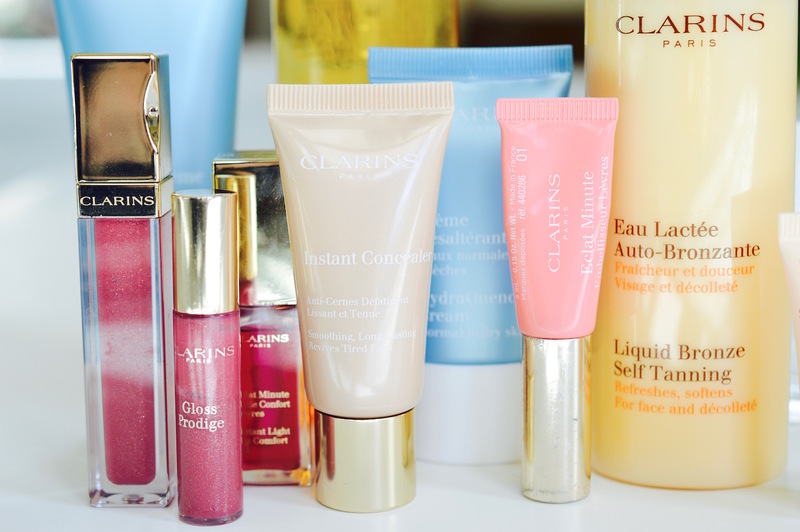 I first tried it after receiving that small sample tube in a GWP which I included in a haul here, and within a few weeks I had purchased the full size. This gloss provides the most beautiful dark rosy-pink colour that complements my skin tone so nicely. The raspberry flavour is amazing, and the formula is even more hydrating and conditioning than most of my lip balms. The big tube should last me for a while, but I will definitely repurchase once these are done. So I totally bought into the hype for this "lip oil", which is really just a sticky lip gloss with the same raspberry flavour as my lip gloss. I got it in that same haul from The Bay (link) as it was a limited edition alternative to the permanent honey flavour. I can't say that I'll repurchase it, but it has a very fun jumbo applicator that almost feels like jelly on the lips. The formula is thick, and can get a bit gloopy. Beware of the dreaded hair-sticking-to-lips situation. This lightweight concealer was a total standout product for me in 2015. I compared it to the Nars Radiant Creamy Concealer in this post, and I decided that the Nars option is a total ripoff - it's $4 more, for less than half as much product! Anyway, even though it is marketed for use under the eyes, I use this light-reflecting, satiny-finish concealer as an all-over foundation. I have two bottles, and it still stands as my go-to base for special occasions. The colour is perfect for both winter and summer, and I can see myself keeping one of these in my travel makeup bag (details here) for years to come. A drugstore dupe? Rimmel Match Perfection All-In-One Highlighting Concealer. This is a beach vacation staple. I really like the light scent and smooth, oil-free finish of this sunscreen. It is a fantastic touch-up mineral SPF for the afternoon, since it doesn't add on another layer of thick cream. I'm also enjoying the Vichy spray-on sunscreen, which I covered in a review/comparison here. I'd probably repurchase the SPF 50+ milk-lotion spray next time to get an even better value. This is a beautiful overnight skin hydrator that goes on thick and doesn't leave my sensitive skin feeling congested. I do prefer the Avène Soothing Moisture Mask though (reviewed here) since it leaves my skin looking more perfected and has a more pleasant scent. All of the HydraQuench creams work well. This one is better for me in the winter, and I always like to take these little deluxe samples on vacation with me. I've only used this serum once, so all I can say is that it makes my skin feel super smooth, and the reviews are really great online. If skin firmness is a concern for you, check this one out! I got this top-seller in the Skin Wonderland set from Sephora (here). This is a seriously luxurious oil that softened my skin better than anything else. The fragrance was quite herbal-y, and provided a nice aromatherapy experience in a hot shower. I would apply a layer of this oil onto my entire body (avoid the feet for safety!) right before hopping out and drying off. This treatment is proven to reduce stretch marks, so keep it in mind for a great pregnancy gift. This refreshing tanning lotion is the only product I'll put on my face and neck for a healthy boost of glow. It goes on like a thin milky lotion, with no tint. The base of aloe and vitamin e calms redness, and the super natural tan always looks good. Just make sure to avoid the eyebrows, moustache area, hairline and the bridge of your nose where glasses sit. Those are the only places that have gone orange on me. Never forget the neck, and always use a gentle exfoliator before using a self-tanner. A gentle baby washcloth (my favourite one here) coated in a face cleanser does the trick. One bottle of this tanner will last you for centuries. 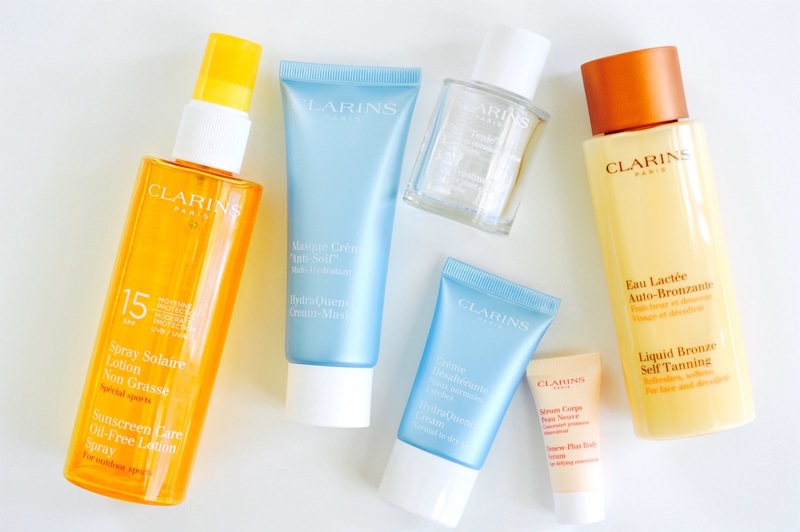 The iconic Double Serum, Beauty Flash Balm skin primer (the first product I tried from Clarins) and the UV Plus +HP Multi-Protection Tinted Sunscreen, which I reviewed here. Next on my wish list? The Gentle Care Skin Beauty Repair Concentrate (link) which is an "emergency" miracle treatment. It takes care of redness, dryness, scabs and blemishes when used before a normal moisturizer. It is formulated with 90% pure plant extracts, and "restores balance and clarity to sensitive skin". Need.